Coconut water is delicious and nutritious. But it's not a sufficient sports drink for replacing sodium and electrolytes lost during sweaty exercise. 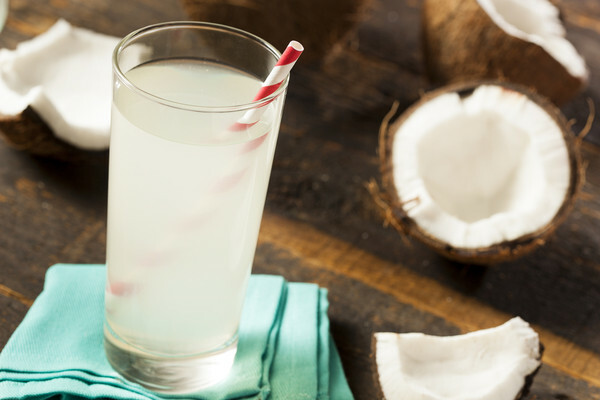 Coconut water is naturally sweet and high in the electrolyte potassium. So it’s not uncommon for people to ask about the use of coconut water as a real food sports drink. But, when assessing the use of coconut water as sports drink, what comes to mind is C.G. Jung’s idea of “shadows” – the aspects of our lives that are in actuality completely opposite of what we think or perceive. It’s an apt reference point, because if sports drinks have a dark shadow, it’s coconut water. Coconut water is fine if you just want something real to drink when you’re not exercising or for short duration exercise (< 90 minutes or less) (1), but if you’re sweating a lot during prolonged exercise, it’s definitely the wrong choice. In the realm of human physiology, coconut water is the exact opposite of what we need to replace the sweat we lose when we are exercising. The reason for this is that the primary electrolyte in coconut water is potassium, whereas the primary electrolyte in sweat is sodium. More specifically, 16 oz of coconut water contains 950 mg of potassium and only 50 mg of sodium. In contrast, 16 oz of sweat contains anywhere from 200 to 700 mg of sodium, and only about 50 to 110 mg of potassium (2,3) (Table 1). Table 1. Electrolyte Content in 16 oz of Coconut Water, Skratch Sport Hydration Drink Mix, and Sweat. The high sodium and low potassium content of sweat reflects the relatively high sodium and low potassium concentration found in our blood or vascular space that feeds our sweat glands. This difference is due to the fact that pumps in our cell membranes that set up the chemical-electrical gradients across cells that allow proper cell function and communication, do so by pumping potassium into cells and sodium out of cells, making intracellular (inside cells) potassium levels very high compared to sodium, and extracellular (outside of cells) sodium levels very high compared to potassium. Because water equilibrates between the major spaces across the body, which include our vascular space (blood vessels), extracellular space, and intracellular space, when we consume an excess of sodium we tend to shift water into our vascular space and when we consume an excess of potassium we tend to shift water into our cells. This is why, in some people, excess sodium consumption can raise blood pressure. Likewise, when we consume foods or liquids that are very high in potassium, we tend to increase our intracellular water stores. During exercise, however, increasing the water volume in our vascular space is what is critical to help provide the necessary blood volume to deliver oxygen, eliminate heat, and provide valuable fluid for sweat. So in the context of exercise, consuming water and ample sodium is much more important than consuming potassium, not just to replace what we lose in sweat, but to maintain an adequate blood volume to meet the increased demands on our circulatory system especially in the heat (4,5). In contrast, consuming coconut water or plenty of fruits and vegetables that are high in potassium along with water isn’t a bad strategy for rehydrating cells when recovering, though it’s important to remember that we don’t deplete nearly the same amount of potassium during exercise as we do sodium. In most cases, drinking a bottle or two of coconut water during exercise isn’t going to kill us, as our kidneys are pretty good at keeping our electrolyte concentrations in check, especially if consumption isn’t excessive. But it definitely isn’t going to help us during exercise compared to a good sports drink with adequate sodium. That said, drinking only coconut water for long periods of time while exercising in the heat is one of the rare situations that could lead to dangerous electrolyte imbalances within the body that may be extremely harmful. While, a lot has been written about the hyponatremia that can occur if we only drink water during prolonged and heavy exercise in the heat, drinking only coconut water can exacerbate the situation, since the excess potassium consumption only compounds the inadequate sodium replacement (6). Thus, in situations where drinking water alone can be harmful, be assured that drinking only coconut water may be just as is or even more harmful (7). Ultimately, coconut water is the exact opposite of what we need when we are sweating heavily during exercise. It’s like Bizarro – Superman’s opposite – a character that Alvin Schwartz, one of the original writers for the Superman strip, found inspiration for through C.G. Jung’s “shadow” archetype. Just like Bizarro and Superman, there are a lot of similarities between coconut water and the all-natural Sport Hydration Drink Mix on the surface – both contain the same amount of calories, both contain electrolytes, and both are made with real food ingredients. But don’t be fooled, when you take a closer look, the reality is that coconut water is the Bizarro sports drink. 1. Kalman, D. S., Feldman, S., Krieger, D. R., & Bloomer, R. J. (2012). Comparison of coconut water and a carbohydrate-electrolyte sport drink on measures of hydration and physical performance in exercise-trained men. J Int Soc Sports Nutr, 9(1), 1. 2. Shirreffs, S. M., & Maughan, R. J. (1997). Whole body sweat collection in humans: an improved method with preliminary data on electrolyte content. J Appl Physiol, 82(1), 336-341. 3. Adams, R., Johnson, R. E., & Sargent, F. (1958). The osmotic pressure (freezing point) of human sweat in relation to its chemical composition. Q J Exp Physiol Cogn Med Sci, 43(3), 241-257. 4. Sawka, M. N., & Montain, S. J. (2000). Fluid and electrolyte supplementation for exercise heat stress. Am J Clin Nutr, 72(2 Suppl), 564S-572S. 5. Sharp, R. L. (2006). Role of sodium in fluid homeostasis with exercise. J Am Coll Nutr, 25(3 Suppl), 231S-239S. 6. Schucany, W. G. (2007). Exercise-associated hyponatremia. Proc (Bayl Univ Med Cent), 20(4), 398-401. 7. Noakes, T. D., Goodwin, N., Rayner, B. L., Branken, T., & Taylor, R. K. (1985). Water intoxication: a possible complication during endurance exercise. Med Sci Sports Exerc, 17(3), 370-375.